Our training services are second to none. 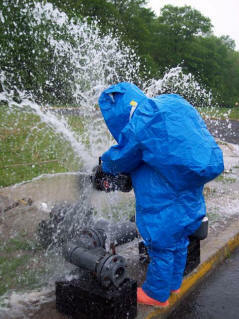 We can deliver customized training programs in addition to the standard OSHA, NFPA, and EPA courses. On and off-site training available. Competent and field experienced Environmental Health & Safety Specialists, Certified Firefighters and Project Safety Coordinators that make up our TEAM. Full service industrial maintenance, tank cleaning, tank removal, Vac truck, site investigation, site remediation, spill cleanup, removal and disposal. Full service Hazardous Materials, marine spill response, firefighting, railcar/tank truck emergencies, confined space rescue operations, emergency response to terrorism and emergency management of small & large-scale incidents.